Put a pot of water on to boil (with enough water to cover your noodles in a bowl). 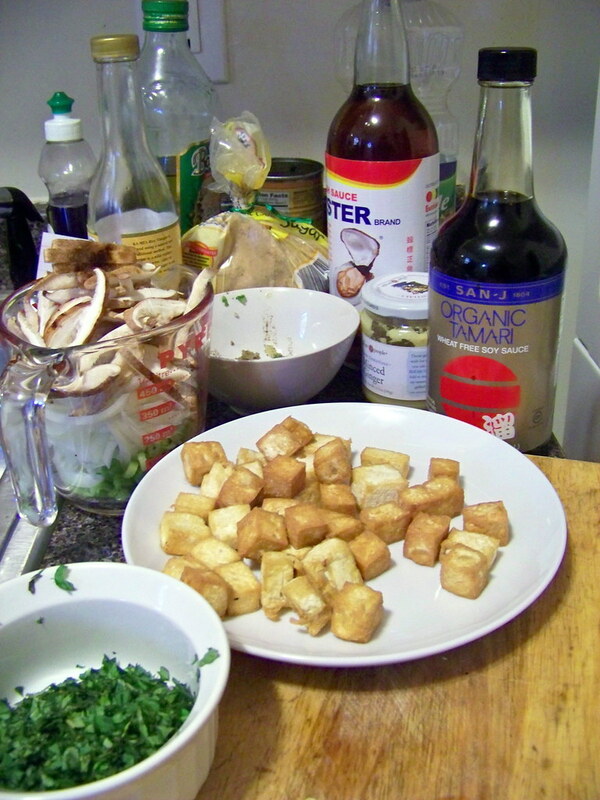 Cut your tofu into cubes, pat dry, and heat about an inch of oil until it shimmers. Carefully drop in the tofu, only a bit at a time, and then stand back because it's going to splatter. Let cook, stirring once or twice to make sure the tofu isn't sticking, for about 3 minutes until the tofu is browned. Drain on paper towels and repeat with the rest of the tofu, in batches until all the tofu is fried. When your water comes to a boil, pour it over the noodles and cover, let sit for 5-10 minutes until the noodles are soft. Drain. Cook the chilis, garlic and ginger in 1 T oil (preferably in a wok, but I don't have one) until fragrant, then add your vegetables. Cook until softened, then add drained noodles and tofu. Stir together soy sauce, sugar, fish sauce, and some extra chili sauce if you want it extra spicy. (I did). Stir together, if it looks like you need some more add more. Add water and rice vinegar, stirring. Taste, adjust if you need more sugar or chili or whatever. Stir in basil, let cook 1 minute, then take off the heat. Serve with cilantro. That looks awesome, I'll definitely try this out. Thanks.